As Android manufacturers are competing for users against each other by increasing the resolution of smart phones, our mobile phones are gradually filled with thousands of big size photos. It helps us keep precious memories clearly, but also makes big trouble when we want to transfer these thousands of pictures from one Android to another, like Samsung Galaxy S8/S7/S6, HTC One A9/M9, Google Nexus 6P/5X, LG V10/G5, or Huawei Mate S. I believe no body would like to move them one by one via blue tooth or e-mail. Here we are going to talk about how to transfer pictures from Android to Android in bulk. Firstly, let’s introduce an app to transfer pictures from Android to Android. Gihosoft Mobile Phone Transfer is a professional software, concentrating on phone to phone data transfer. With it, you can transfer photos, contacts, messages, call logs, music, videos, etc between Android phones, like Samsung Galaxy S6/S6 Edge/S7/S7 Edge/S8/S8+ and Note 5, HTC, LG, Sony, Nexus and Huawei. Run Gihosoft Android Photo Transfer and tap “Phone to Phone”. Connect two Android devices to computer and select “Photos” to transfer. Click “Start Copy” to begin photo transfer between Android. By virtue of its powerful processing ability, Gihosoft Mobile Transfer will finish the transfer within minutes. Gihosoft will only make a copy of photos to the destination device. The data on your two Android devices are absolutely safe. 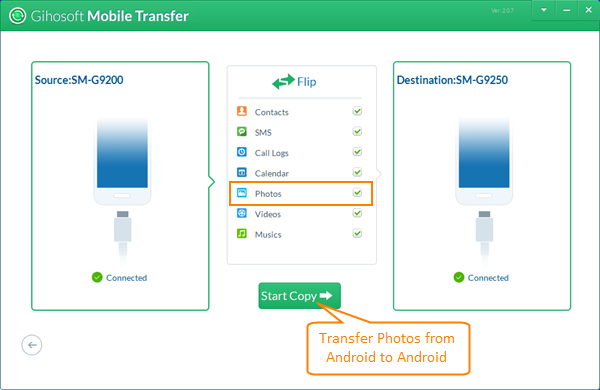 To learn how to transfer videos and music from Android to Android, please check this guide. Then, we come to Google service. As a powerful cloud service, Google can backup almost all data on your phone to its server. Therefore, we can backup photos to Google + on one Android, then log in to Google + with the same Google account on another Android. In this way, we can transfer photos between Android phones breezily. Connect two Android devices to network (Wi-Fi is recommended). Download and install Google+ app to the two Android devices. 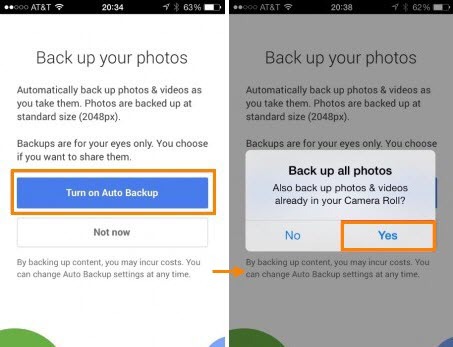 On the Android that stores you photos, set up Google account on Google+ app, go to “Back up your photos” page and turn on “Auto Backup”. It will take a while to back up all photos. Log in to Google + on the other Android with the same Google account. Go to Photos section, and you will be able to view the photos that have been backed up. Syncing photos to Google server can be extremely convenient since you can get access to the data by logging in Google account on any mobile device. However, people who consider privacy serious are not recommended to use it.